Wouldn't this be a great setup for the next Garangutuan-Destroys-Japan movie? Nautilutron has to fend off the evil Crabra to save Tokyo? Anybody with me? As a side note, I have never felt so much sympathy for a crab. It's one thing to get tossed into boiling water and end up in the next crabfeed. It's quite another to fall prey to a nautilus for all the world to see. 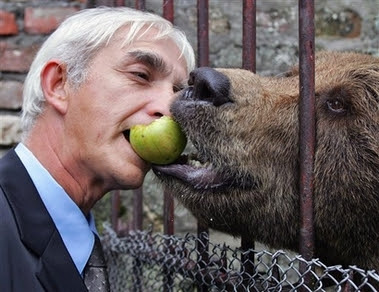 I know that monkeys are supposed to be very close relatives to humans, but I'm seeing very little proof of that here. Unless, of course, Don King got himself a grill with some fangs on it. Then I can see the resemblance. But I did specify human, not evil-boxing-promoter. UPDATE: Zanna has identified this as a gelada monkey. Lovely. Could He Be Less Reverent? 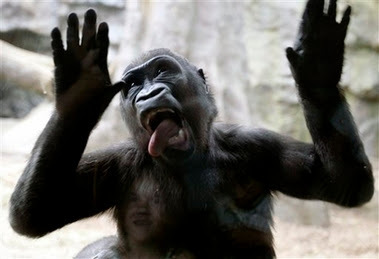 This gorilla was posing for the Earth Day events at the Franklin Park Zoo in Boston. Has he no respect? Could he be less reverent? Here is another installment from the Jade Walker files. 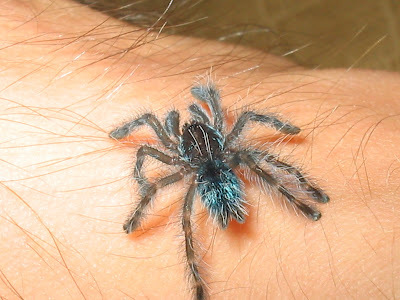 Below is an Antilles pinktoe tarantula - Avicularia versicolor. These beauties get to be about 4" across and are fairly docile. They are also one of the most desirable ones in the hobby due to their coloration. The bottom photo is of a baby Antilles. 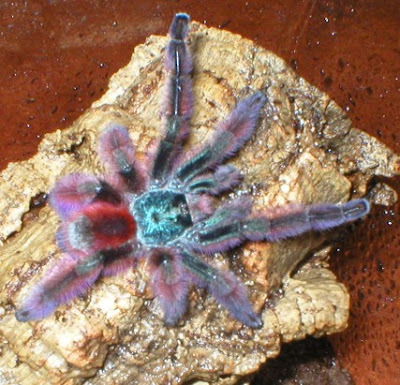 I'll admit that for the first time, due to the colors, I considered getting a tarantula for a pet. But then I remembered that it is a spider and that I'm arachnophobic. That's a deal breaker. Thanks for the photos, Jade. 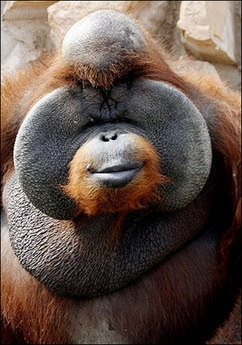 The caption to this photo states only that this orangutan is resting in the Riyadh zoo, in Saudi Arabia. 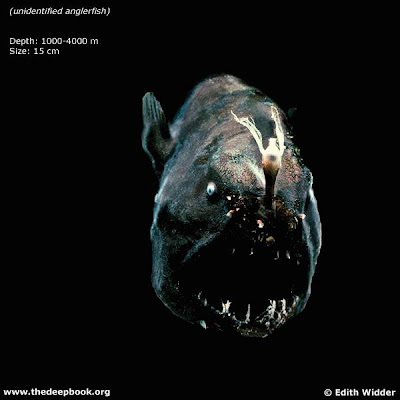 There are a bunch of spectacular photos of creatures that have never been seen on this blog, but I couldn't pass by this anglerfish. I love that it is labeled as 'unidentified'. That makes me feel better about my own lack of knowledge. This photo also makes me feel better about living on dry land. I understand the snaggleteeth and the lure, but, really, does that eye need to be staring at me? 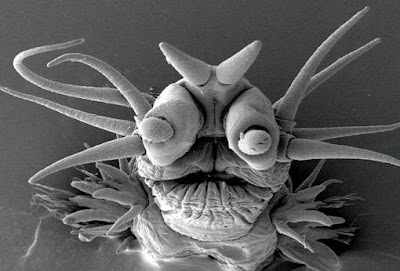 You're looking into the mug of an annelid wom, found near a deep-sea volcanic vent. It looks like a muppet gone wrong. Perhaps Jim Hensen stayed up too late one night and forgot his coffee. 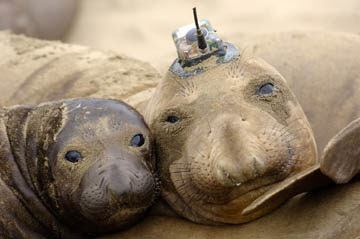 Elephant seals are massive animals. There's a lot of surface area on which to plant a transmitter. I wonder why the researcher chose the head of all places as the best place to afix this one. Seems inconvenient to me, but what do I know? My transmitter was firmly planted on my rump years ago and it hasn't hindered me much at all. As a side note, how did the photographer manage to get both mommy and baby to look at the camera? I can't get my own kids to cooperate like that, and they don't weigh enough to smother me! Regardless, that transmitter makes this otherwise touching picture look eerie and incongruous. This post is more of a public service. 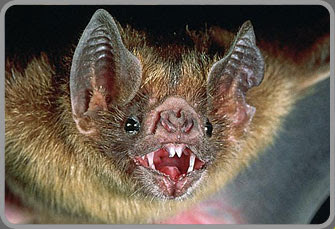 I know that many of you woke up with this morning wondering if you were at risk of encountering a vampire bat. So let me lay it out straight for you: you are at risk. * In fact, you will most likely be attacked tonight. * And you probably won't survive the encounter. * I am sorry. Thanks for the photo, Shaina. * This assumes that you are a livestock animal that lives in Mexico, Central or South America, near a vampire bat lair, who will spook at seeing your blood dripping from the small incision the bat makes, and then bolt onto the highway into oncoming traffic. Humans tend to stroke their chins when contemplating something of great profundity. 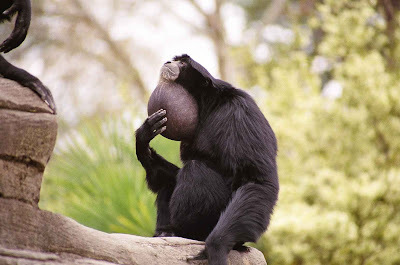 I assume that the siamang equivalent is to stroke your inflated throat sac when contemplating at whom you would like to throw your next steaming pile of excrement. Thanks for clueing me into the siamang, Lorri. I've neglected this vine-swinging primate for far too long. When the Going Gets Tough..? This photo is too much! These two hapless fish-handlers have a hagfish in their grip. The woman is sporting a nauseated look, in contrast to her shirt...When the going gets tough...the tough get queasy? The man, on the other hand, looks weary and resigned. Maybe he's even having an existential crisis. I can understand that. I can't imagine the scenario that would involve me handling a hagfish like this. 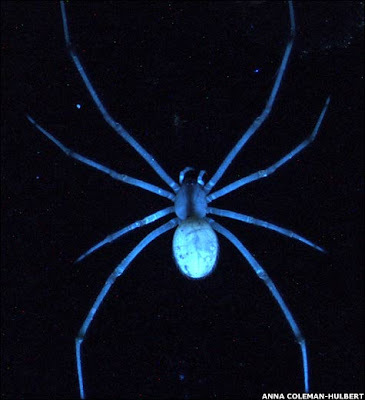 Below is a ' fluorescing spider' (that's a nifty screen name for any of you non-bloggers to sign up with...). In the science world it is known as Enoplognatha ovata. So what does one have to do to be labeled 'fluorescing?" Why, you need to glow like this under UV light (which I don't, sadly). The BBC reports that scientists at Portland State University "discovered that many spiders from different families fluoresce. They suggest it has something to do with getting food and avoiding being eaten." Hmm, add to that 'to assist in mating' and don't you have a complete list of what every trait of every animal is for? Sorry scientists at Portland State, but that doesn't help much. Can you narrow it down? This is about as toady as a toad comes. She's glistening in the flash of the camera, she has warts, and she has saggy, saggy skin. If I were a witch of yore I would be squealing with delight at such a find - there would be several potions and hexes a-brewin' in my cauldrons. Thanks for the link, Aaron. I must be feeling the weight of wading through so much ugly of late. Perhaps the burden I bear is one of guilt, for I feel the need to make some atonement to a beast that I have taken particular pleasure in putting on display here. 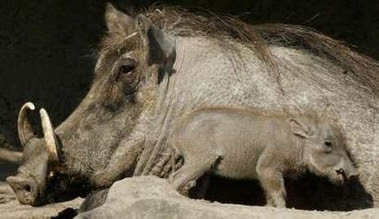 Below is a cute photo of an ugly animal - a mama warthog and her warthoglet (new word!). Hmmm. Now that I look at it closer, I don't think it's so cute. Oh well. There goes my attempt at reconciliation. Sorry warthog. I tried. Candied sent me this link. 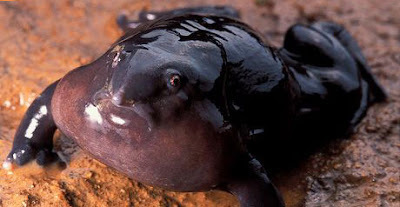 This bad boy was pulled from the Congo River. 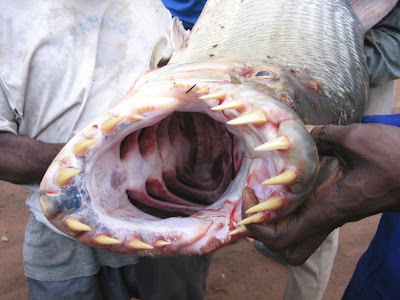 It's a tiger fish, and it proves that age-old addage: Don't Swim in the Congo River. Thanks for the photo, Candied. I don't post on diseased animals unless it serves a purpose. And the purpose of this post is to do some bunking. That's right. I've debunked in the past, so here I am, bunking. 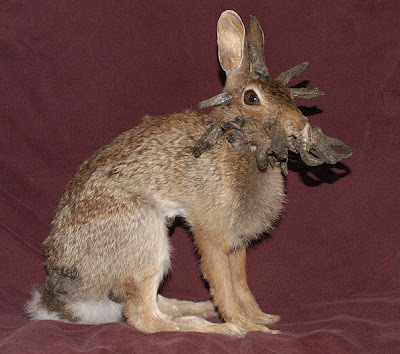 You all know about the antlered jackalope. But the truth is that they really do exist, at least in the form of diseased bunnies. These critters, see below or click this link, suffer from a viral infection similar to warts. The virus causes them to grow keratin horns all over their body, not simply on their head. Oh, and this will ruin you for the day: people can grow them, too. Just check out this link and scroll to the bottom. You'll tremble. Thanks for the links, Pamela. You have made me paranoid about every little bump and blemish on my skin. Thank you so much. The curly locks on the beard and those disinterested eyes - oh, and that tongue - all combined to prompt me to post this photo. I'm thinking this beast is a yak, but I am far from a bovine expert (unless you want to talk steak). Did you know that there are twenty four species of medium-sized to large ungulates (a group to which bovines belong) out there? I didn't either. I don't have the time to compile a comprehensive list of said ungulates, but I imagine most have been yoked with a plow or have been bred for the dinner plate. UPDATE: I am a fool. 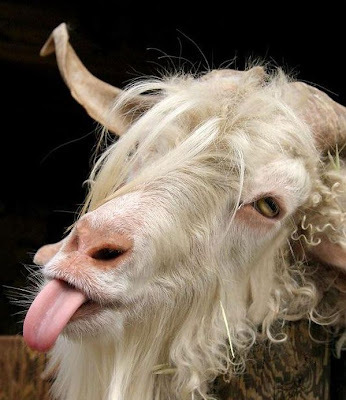 According to many of you, this is no cow, but a goat! Most likely an angora. One of you should be running this blog, not me. 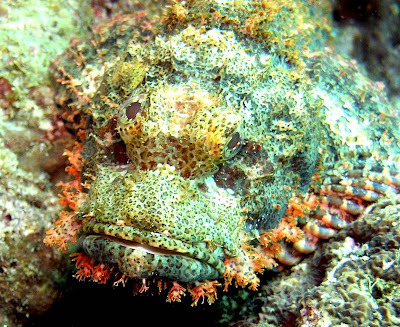 The reef stonefish is the most venomous fish on the planet. They come equipped with thirteen dorsal spines, each one ready and willing to inject passersby with agonizing toxins, toxins that can kill. Chrissie sent me this photo, and I need some herpatology help. 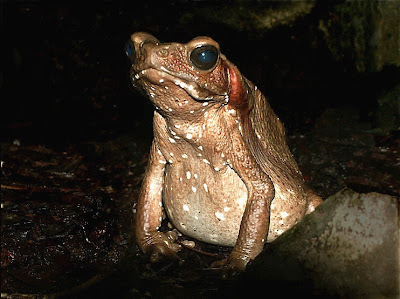 What is this glistening, bloated frog? There are roughly 4,740 species of frog in the world, so I'd have a hard time narrowing it down. 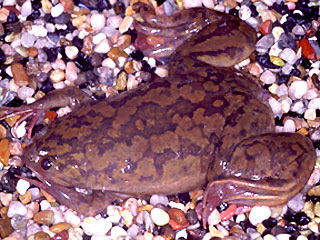 UPDATE: Looks like Julia, Silena, and bats have all identified this frog as Nasikabatrachus sahyadrensis, or the purple frog from India. Thanks all! This is one of those moments that causes you to reflect on why bad things happen to good people, and why bad things don't happen to bad people. But, no, instead a Nile crocodile in Taiwan has to bite off the lower arm of his veterinarian (see link below). The vet was only working to preserve a species that is dangerously close to extinction, and the thanks he gets is a severed arm. Fair warning here people: clicking this link will send you to a Reuters photo of the Nile croc with his veterinarian's severed hand in his mouth. Gruesome. But they were able to reattach it. See what I'm saying? Life isn't always fair. I don't know what species of monkey this is, but I think I've seen him rendered as the face of a monkey god in an African or Chinese pantheon. He strikes me as a playful sort (surprise for a monkey). 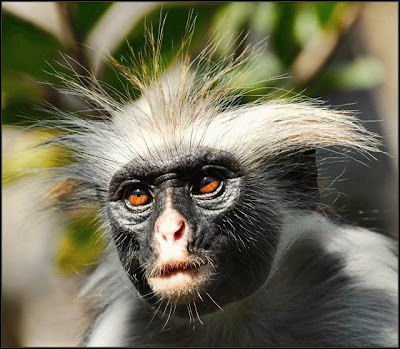 I challenge my readers to identify this monkey. No doubt Sun-Wukong will bless you for naming one of his lesser cousins. UPDATE: Someone has identified this monkey, but, ironically, has failed to ID him/herself. Thank you anonymous - it looks as though this is a Colubus Monkey. 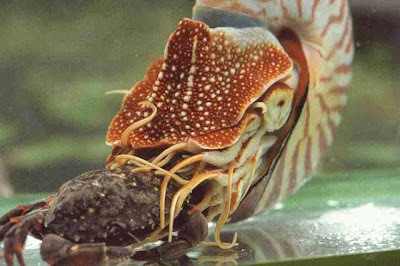 Both Manji and Jennifer sent along this link to an article that spotlights 10 horrible sea creatures. Jennifer mentioned the Giant Isopod, which I've featured before. 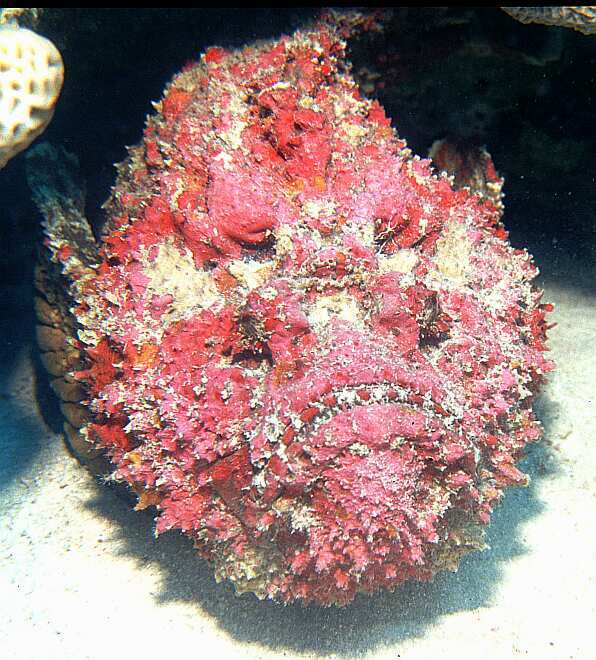 There's also the anglerfish, the viperfish, the fangtooth, and several others. 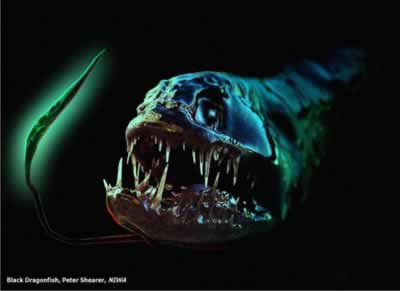 I thought I would highlight the deep sea dragonfish. Isn't it lovely? 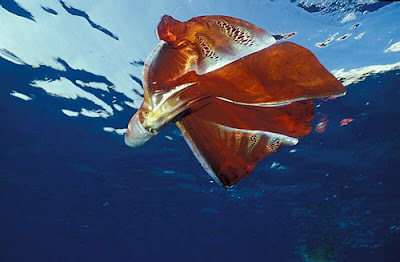 These guys, like the anglerfish, have photophores that dangle on the end of lures that they use to bring prey in close. But that's always confused me. What is it about glowing food that makes other fish want to eat it? If my food were glowing, I would steer clear. Also, I can't imagine that it is a good survival trait to be a bite-sized glowing fish. Thanks for the link, Manji and Jennifer. 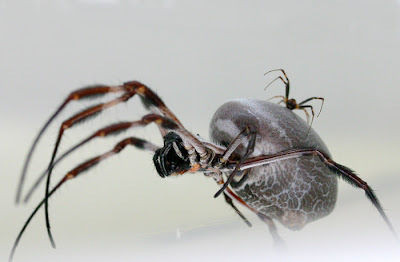 I don't know my orb weaver spider ecology very well, but I'm assuming that is a pre-mating photo. I know that sexual dimorphism (look, I'm learning big words!) isn't uncommon in nature, but this is outrageous! I for one am very happy not being a male spider. Not only do I not find female spiders attractive in that way (my relationships with she-spiders have always been platonic at best), but my ego is too fragile to endure the size differential you see here. Thanks for the photo, Lance. 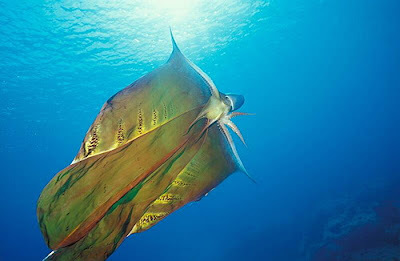 I would love to see a tremoctopus in the wild. Of course, if I saw one floating over head I would assume it was some sort of netherworld creature come to claim my soul. Or, if I had my head on straight, I would know that she had deployed her webbing to defend herself against a predator. Maybe a shark. Maybe I don't want to see one in the wild. Callandrea, no doubt having grown weary of my centipede posts, decided to take matters into her own hands by taking this photo of a donkey at the zoo. Thank you, Callandrea. You have successfully diluted the centipede post concetration on this blog. Unfortunately, you have also increased the concentration of equines-with-grass-in-their-teeth posts. See? The universe always strives for equilibrium. Laws of thermonuclear dynamics and stuff, I think. 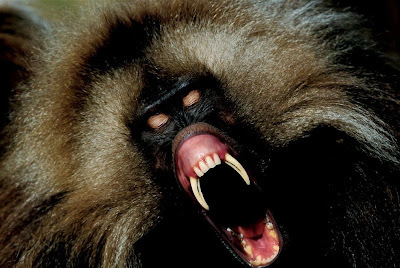 I've been very hard on baboons. So, when I came across this fantastic photo, I thought I might post it as a means of reconciliation. 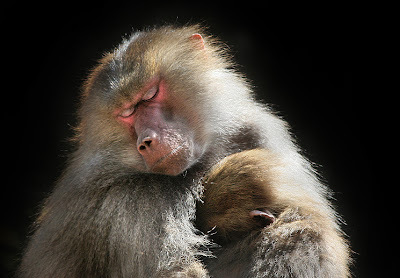 I won't comment on the mother's nose or the close-set eyes, or the fact that baboons in general are obnoxious. I'll just leave these two to their slumber. Silena emailed me to highlight some of the differences (such as weight and neck length) between the alligator snapping turtle and the common snapping turtle. And she should know - check out this beast she encountered near her house a couple of years back. The turtle had come up to lay eggs and got tired enough in the process to rest by the roadside and let Silena take some photos. Now I'm wondering where that egg nest is. I could use a few guard snapping turtles around my yard to keep bandits away. In an eerie bit of synchronicity, Meg saw my hornbill post and forwarded to me a link of some art she had done recently featuring a hornbill. Everybody say hello to Bugsy. 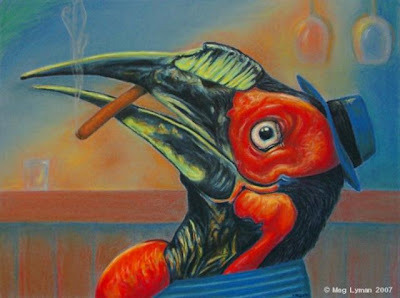 Meg's really captured the essence of the hornbill, hasn't she? Thanks for the art, Meg. You've got some talent! 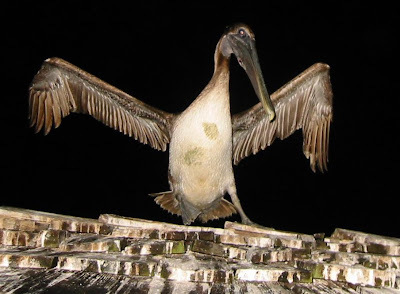 David encountered this evil pelican in Jacksonville, Florida, on a pier off of Neptune Beach. He was being chased by Satan's bird whenever he tried to walk by. Be careful, David. We already know that pelicans have recently turned to eating other birds - who knows if humans are next? I don't want one of my readers to be the unlucky one to find out. Andrea sent me this Fox News article, about a killer African frog that is wreaking havoc in a Golden Gate Park pond in San Francisco. City officials have been combating the frogs since 2003, but the amphibians continue to eat their way through turtles and fish, and have even turned to eating each other. Thanks for the article, Andrea. 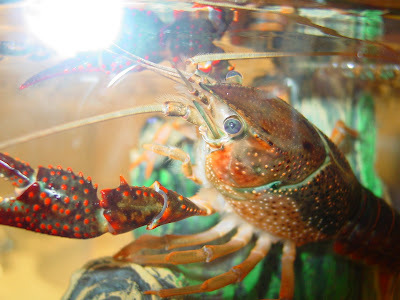 Paul sent in this photo of a crawdad (crayfish to you hoity-toity types), and it brought back many fond childhood memories. I can't count the number of summer days I spent in the creek by my house, catching these, getting pinched by them, and then setting them loose again. This photo, sickeningly enough, also made me salivate. I've eaten my share of them, and they are tasty - provided you catch them from clean enough water. Thanks for the photo, Paul.